It was the day of the 2008 Historic Churches Bike Ride. On this day, churches all over England stay open, and people are sponsored to cycle between them. You can also walk, and the welcomers at each church can also collect sponsors. The event is particularly well supported in East Anglia, where it first began nearly thirty years ago. It raises thousands of pounds every year, half of which goes to the Historic Churches Trust of the county in question. The other half goes directly to the home church of the sponsored cyclist, so some smaller churches take the day very seriously. My perception, generally, is that fewer and fewer people are taking part each year, but the amount of money raised seems to keep going up. We'd just been to Riddlesworth. There, the church had been locked and bolted, just as it always is. There was nobody on duty there, no one to welcome cyclists or walkers. Given that the church is a good half a mile from the nearest road, I thought that this was a bit rich. At the very least, they could have put a sign out up on the main road. Something along the lines of Riddlesworth Church is not taking part in the Historic Churches Bike Ride. 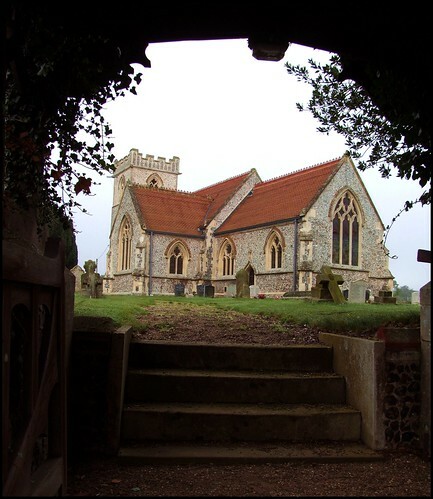 We have no interest in raising funds for historic churches, and furthermore we will never ask for a grant from the Norfolk Historic Churches Trust would have done. Unfortunately, a similar sign at Brettenham would also have been needed, because Brettenham church was also locked up without any sign of life. To be honest, I had expected this. The nice lady at Rushford had already told us that Brettenham church had been effectively abandoned. There was no one in the parish interested in keeping it open, and services were no longer held there. You could tell that from the air of neglect. Although the graveyard was neatly clipped, presumably for the activities of the pagan cult of the dead, the church itself was shabby and dirty, with holes in the windows and the porch full of dead leaves. This is a great shame, because Brettenham church is one of the major East Anglian works of the 19th century architect SS Teulon. He had been appointed by Lord Buxton to rebuild Shadwell Park, the great house to the east of the church, and in 1852 he turned his attention to replacing the little Norman building which had previously stood on this site. He retained the base of the 14th century tower and the Norman south doorway, but everything else here is his. It must have cost a fabulous amount of money. The church underwent another massive restoration in the first decade of the 20th century, when all the stained glass and furnishings installed by Teulon were removed (the woodwork went to Rushford) and replaced in an elegant Art Nouveau style. The glass is one of the most extensive ranges in East Anglia of the work of AL Moore. The glass means that it is impossible to see inside, but by poking a camera through some of the numerous holes it was possible to photograph part of the screen, and some of AL Moore's beautiful work. A sign told us that, if we wanted to see inside, we would need to call at one of the local farms and speak to the owner. The farmyard turned out to be a lorry depot, and we asked a man with his head under a bonnet if the owner was about. He helpfully went to a shed to phone up, coming back to tell us that the boss would be down in a minute; but these must have been south Norfolk minutes, because we waited for nearly half an hour, and nobody turned up. It was a shame, but there were other churches to see, and so we left, driving back past St Andrew on the way to the Suffolk border in search of friendlier and more welcoming churches. I thought about it later, and it made me a bit cross. Thousands and thousands of pounds were spent on this building, millions in todays money, in two significant restorations, and it has now just been left to rot. It hasn't been declared redundant, and even if it was it is not certain that the Churches Conservation Trust would be asked to take it on. It really needs some kind of emergency compulsory purchase, perhaps by English Heritage, before things are allowed to go too far; but there is no mechanism for this. At the very least, St Andrew needs to be placed on Norfolk County Council's Buildings at Risk register as soon as possible.